In a new ad for the 2019 Corolla hybrid, Toyota again decided to take a cheap shot at plug-in electric cars by showing a recharging EV left behind in the dust. Moreover, the conventional hybrid car was called a “self-charging hybrid” to underline that it doesn’t need charging points. With such an approach, we could easily bounce the ball the other way and say that Toyota’s hybrids are just gasoline cars, with a slightly more efficient drivetrain. But those hybrids get left behind when they need to fuel up. Well, all-electric cars are the future. Toyota will feel the effects of its propaganda when it is eventually forced to introduce BEVs to its customers. Those customers will remember these anti-EV ads, we hope. “The start of an exciting new era for the world’s best-selling car. 155 Comments on "New Toyota Ad Again Attacks Plug-In Electric Cars: Video"
According to Manager Magazin, Toyota and the Japanese government is strongly promoting hydrogen development, with political consensus built across the nation. This confirms that Japanese government and society want hydrogen. Just fine, it is their choice to go for hydrogen. But does Toyota really needs to take the cheap shots to EVs? Hopefully, the Model 3 has been attracting Prius customers, and I believe the Corolla Hybrid will canibalize Prius sales, so, as Prius sales continue to fall further in the global market (following the current trend), Toyota will have its Kodak moment, oh oh, and realized they bet to the wrong horse. Toyota massively improved their hybrid technology over the years. The Prius has gotten bigger AND more efficient in every generation. The Prius Prime was the second leading plug-in vehicle in the US last year, IINM. I was talking about conventional hybrids, not plug-ins. Anyway, do you know why Toyota is so reluctant to use lithium batteries? Why they do not use a larger battery in conventional HEVs? And even the flagship Prius has increased fuel efficiency only from 50 mpg to 56 mpg in the top Prius Eco, that is not much improvement in 20 years. Based on today’s EPA rating measure, the first Prius offered here delivered a combined efficiency rating of 41 MPG. Seeing that value rise to 50 MPG while becoming larger, delivering more power, and with AWD is impressive, especially considering how much production-cost was back when it all began. As for the claim about being reluctant to lithium, that’s nonsense. The plug-in and 7-seat models have been using lithium since back in 2012. With respect to using a larger battery in a non-plug model, why? Bigger is not better. Only so much generated electricity is available. More capacity would just be a waste. Lastly, your claim about “flagship” is an act of pure denial. My lifetime average as of 28,862 miles with my Prius is 106 MPG… and I drive my Prime hard. Multiple trips to Wyoming at 80 mph without plugging in really pulls down the average. Toyota is not relutant to use lithium batteries, they do it by choice. Nickel metal hidrate batteries are better designed for continuous charge and discharge use cases, they don’t hold as much energy or allow as much output, both of which are not important on an HEV that doesn’t need lots of power from the batter and rarely has it at full capacity. Plus it’s cheaper. If it’s only as easy as some gov’t mandate to switch over, we’d all be paying $16/gal to drive a 4 seat Corolla and wait in long lines like at DMV. In this global economy, H makes zero cents, not only for cars but for energy storage. There are far better (cheaper) options out there, and no single government can bring people to adopt many times more expensive H.
Cue the usual H people saying gasoline is more expensive in Japan and H will come down in price. To that, I say “show me the money”. This confirms that Japanese government, and certain parts (altho certainly not all!) of Japanese society, are in the firm grip of wishful thinking. Sadly for them, all the wishful thinking in the world isn’t going to make compressed hydrogen into a practical or affordable fuel. The only real question is just how long it’s going to be before the various levels of Japanese government faces reality, and stops throwing money down the rathole of subsidizing fool cell cars and hydrogen filling stations. Reading the article I thought that a substancial part of the ad would be an attack against electric car while in reality all it does is filming an pluggin charging for something like 2 seconds. Besides, if your thing is long distance travelling at high speed average for sure EVs are not yet the best choice, that’s nothing new and Toyota emphasizes this. Business as usual. EV is indeed the best choice even for distance travels, seen from a cost and emission perspective. I’m sure he takes all things into consideration as we all do, but perhaps he is not hell bent on forcing his values on others as the fanatical bev only base does. You’ve no doubt calculated the environmental cost of battery production and disposal, and the environmental cost of electrical production. If you could post those studies here to enlighten the rest of us, that would be helpful. Lol the cost of “electrical production”? Do you even understand what you’re writing? ICE vehicles don’t spring fully formed out of the ground old chap. They are manufactured just like battties are. Both are polluting processes but only the ICE continues to poison you as you drive it. Ever wondered where your oil change waste went? Ever wondered how many rare earths are in an ICE cylinder head? Do you know where your broken gearbox or radiator ends up after you replace it? With all due respect if you are taking only emissions and cost into perspective then best mean of transportation will always be public transportation. On a full scale overview from start of construction to junk yard even a diesel bus carrying 60 passengers will always do better than the smallest EV like a smart or VW eUP. Public transportation doesn’t go everywhere. Public transportation can’t get you somewhere in an emergency. Public transportation doesn’t allow you to tow/haul what you may need. Amazes me, every day here, how people are willing to call out an ultimate verdicts … like this or that is “best”. No, it never is, and never for everyone anyways. So many variables involved that it makes wrong to start with. Yup. What is “better” or “best” is highly subjective. It may involve weighing many factors, and we subjectively weigh those factors differently. Your yardstick may measure things very different from mine. The saying “Your mileage may vary” applies to a lot more than just a gasmobile’s MPG! My bicycle beats mass transit any day. I like light rail and ride it with my bicycle partcway at times. We need lots of choices. WE ALSO NEED LOTS OF EXERCISE. get out of your car, bus,train and plane and walk sometimes. Lost time is a cost. From a cost perspective, BEVs aren’t (yet) the best choice. My time spent fueling my car went from 5-10 minutes per week to 42 seconds per week. Yep, 6 seconds per day: 3 to plug in when I get home and 3 to unplug before I leave. While I know some people like to eat in the car, we’ve always stopped for meal breaks on road trips. I’ve found my 3 is usually ready to resume the trip before we’ve paid the bill for lunch/dinner. Since we didn’t have to stand by the car monitoring the fueling process, the time time to charge was better than, or comparable to, pumping gas then eating. How many kw you get in those 3 sec? Gas costs money too. In trucking industry, gas savings is worth the lost hours. Especially in places like Europe. In the US, truckers are typically paid by the mile. If you’re sitting, you’re not earning money. I don’t think Toyota implies that the Corolla hybrid needs no gas. Do you, really? Yes they do imply that. It’s misleading. The word ‘hybrid’ means gas-electric hybrid, i.e. it needs gas. All that time you spend driving to and from a gas station every week is a cost which is not paid by those who charge up their BEV, or one of the longer-range PHEVs, every night. Even the additional time spent on charging a BEV during long drives may be much more than offset by the time saved in charging at home, if you only drive a BEV beyond its normal range a few times a year. It’s been proven that for most people with a BEV they will spend less time recharging their car than people spend gasing an ICEV. Of course if you travel long distances regularly that requires charging on route then this won’t apply but most people don’t do that. If you don’t want to keep polluting cities with internal combustion engines then better to leave the hybrid behind. They have terrible performance are over complicated and over priced for what they are. The fact people are abandoning Toyota hybrids in droves for the model3 says it all. So, from a consumer perspective, you are wrong. Emissions? yes, cost? no. 300,000 miles in a Corolla hybrid will cost something like $13,000 in gas, maybe another $5,000 to $10,000 in maintenance. That is still going to be cheaper than a Model 3, and not factoring in any time as money losses. Granted, if you look at a comparable car, like a 335i, then sure, the Model 3 will be cheaper operating costs. However, in terms of minimal cost you need cheaper long range capable EVs before they win for an absolute value. Sure, if you ignore the cost of negative externalites of fossil fuels, but if you include those EVs win hands down. But collectively as a society have not found it necessary for negative externalities to account for, hopefully for the planets sake that will change. At minimum a carbon tax, but we’ll see. Do you to compare driving a Corolla with driving a model 3??!!!!! The model 3 is a pleasure to drive, a corolla is bucket with wheels! No they aren’t. They do the job perfectly well for most people at a competitive price. It was the number one selling car in the world for decades for a reason. In most markets, the market leaders are the ones which are adequate to satisfy the need at the lowest price. I think it’s safe to say that the overwhelming majority of Tesla Model 3 drivers would describe their car as much more than merely “adequate”. So let us please not confuse quantity with quality. ” an early Honda Civic”. Yes, 1974 Civic was my first NEW car. Under $3000 and a blast to toss around. I still dream about it from time to time. It’s a dishwasher with wheels, Toyota only makes soulless appliances, heck they had to go running to BMW to create a new Supra (and man is it ugly). Whatever ability Toyota ever had to deliver inspirational vehicles is certainly gone. I can get a TM3 for less than that right now in CA….and that turd needs another 2-4k in options to make it somewhat comparable to the 3. I’d love to get a TM3, but the TM3 will cost zero for electricity and maintenance for 300000 miles? And comfort. To much noise and vibration in a gasser to do long distance in comfort. Also no autopilot. Emissions, yes in most cases, cost maybe sometimes, convenience, not. So what EV owner actually charges their car and just waits outside waiting for it to charge? Really bad representation of EV’s and charging. Most EV charging happens overnight. On road trips I just take a catnap, bathroom break, eat a meal or get a coffee. Except it isn’t. Calculate the total time the average current EV owner has to wait at their car for their EV to charge over a period of 1 year and 13,000 miles taking the average 0-1 out of town trips of 400 miles or less that statistics show the average American takes. Remember that charging for most current EV owners happens in their own parking space over night or when they are home. Now compare that time to how much time the average ICE owner spends driving to and into a gas station and waiting at their car for it to fill up over a period of 1 year and 13,000 miles taking the average 0-1 out of town trips of 400 miles or less. Which owner wastes more time waiting by their car? From the title of this article I was expecting a long Toyota hit piece ad on EVs not the 3 seconds or so where some non descript EV was being passed whilst charging. I thought it was a good ad but for a British market ad did anyone else notice that they are driving on the right side of the road? What Toyota points out is essentially correct however as state of the industry charging is at best 1 hour to full charge. My MS has the 85 kW pack and for that reason we have only taken it on 2 road trips is the hour we have had to sit and wait for it to charge up. Central VA to Miami was the last road trip in it and the last time we will use it for a road trip. It added almost 3 hours to our travel time. My fiance and I actually enjoy driving so that’s why we didn’t fly but for the next one in March to Myrtle Beach we will be taking her Volt to minimize our down time. I just did Northern VA to Wilmington and stopped twice to charge for a total of 60 minutes (Richmond and Rocky Mount NC). Depending on how central in VA you are I would think one 40 minute stop in Rocky Mount (if that’s the route you go) would get you there. Enjoy lunch at Outback while you wait? Why do you wait 1 hour to charge? I take my Model 3 on road trips all the time and charge for 15-20 minutes and then drive for 2 1/2 hours and repeat. If I leave on a 400 mile/5 hour trip starting with a full battery I only have to stop once for 20 minutes. I am not sure you’ve traveled long distance in an EV. I think road trips in an EV is a lot easier and less stressful than most people think. Charging is definately cheaper than gas. With more DC chargers and bigger batteries, it will only get better. Not necessarily. When compared to the 52-MPG Corolla hybrid in this article, the 52-MPG Camry hybrid, and the 56-MPG Prius Eco hybrid. The average price gasoline is the U.S. these days is about $2.28 per gallon. The Camry hybrid has a 13 gallon gas tank, so a fill up will cost $29.64 and give you 676 miles of range. In the US, the average cost at a Tesla Supercharger is $0.31/kWh. A Model S with a 100 kWh battery has about a 90 kWh usable capacity giving it a 335 mile range. Fully charging the Model S with 90 kWh at a Supercharger will cost $27.90, about the same cost as filling up the Camry hybrid, but giving the Model S only 1/2 the range of the Camry hybrid. You’d have to charge the Model S a second time from empty to full for another $27.90 to drive the same 670 miles that is the range of the Camry hybrid. So charging a Model S at a Supercharger would cost almost twice as much as the Camry hybrid to cover he same distance. If someone is standing at the charging station while their car charges they are doing it wrong. Stations are located at places you can eat, shop, etc. Toyota knows this and chooses to ignore it and play to the common misconception so they can bash on EV’s. This isn’t an attack. It’s just a good ad. When promoting a vehicle, it only makes sense to tout it’s benefits. They wouldn’t use this ad for their Prius Prime. It’s a lie, hybrids don’t self charge that is patently ridiculous. I really want to see a lawsuit. Also detaining toyota execs, and zero mercy. Hybrids charge their tiny (by plug-in standards) batteries during breaking and cruising. I don’t know how else you could understand their “self charging” claim. Agreed prsnep. Let Toyota have their cutesy phrase ‘self-charging’. Everyone who ever buys hybrid vehicles knows what they mean. Its rather as when some here have gotten hung up over the mileage a Volt gets but does not factor in the electricity consumption. Big deal. Just as volt buyers know they will have to pay for some electricity – in the same way Toyota buyers know they will have to buy some gasoline. You guys are getting all hung-up on the phrase ‘self-charging’. It is rather as if there was a portable generator in the trunk and it is charging the battery – which is essentially what is going on here. It is in that sense that the Toyota is self-charging. People understand that a plug-in charges but does not usually get free electricity. Likewise the ‘self-charging’ here is also not free – gasoline must be consumed by the engine to effect the charging of the hybrid battery. Its rather silly to get hung up on these terms – in that they are clear enough as to what they mean, and confusion only results from people who are trying to muddy the issue. At least they don’t self charge better than BEVs. Their commercial is accurate. All electrics have to recharge rather slowly compared to getting a tank of gas or diesel. Driving long distances in an electric is one of their weak points. When did pointing out the obvious (truth) become a cheap shot? Consumers aren’t going to care about these commercials if/when Toyota chooses to sell an all electric. If the price is right, and they like the car, they’ll buy it. This commercial is inaccurate and misleading. No car is self charging. I can see lawyers running with this opportunity, as there will be customers complaining their “self-charging” cars are not actually self-charging and don’t move at all if the tank is empty. EU fine for scam ad would be great idea too. Go to the compute tech support forums, you be surprised the number of times techs report non-working routers as not plugged in. Reason from the clients “But it says it is Wireless, why would I have to plug it in?”. The number of people with these hybrids will think self-charging means they never need to be fueled. That is until you watch the latest Fully Charged show. Slow onboard solar PV isn’t the “self charging” EV solution, but it hints at a nice start to better future vehicle integration into lessening future peak grid demand. Sono Sion doesn’t have a gas tank. The stupid corolla is useless without a gas tank simply because 100% of the energy comes from the gas tank, no exceptions. The Prime, Volt, and others can self-charge via gasoline generation at the push of a button by the driver. All hybrids do through regen….still that is a lame way of charging an ev and only make sense if done as auxiliary not primary. Yes, it doesn’t make sense/cents to self-charge in your driveway or anywhere where a plug is an option. Rather it makes reasonable sense/cents to self-charge on a highway trip while the ICE is running anyways and then use EV at the destination where lower speeds greatly favor EV efficiency. IOW, the infinite (999mpg) one gets driving around in EV at the destination more than makes up for the 1-3 mpg drop during the highway self-charge. For the corolla hybrid to have the car moving in the first place so that it can brake, a gasoline had to be burned. The only energy source is the gasoline in the tank and nothing else, they don’t have a plug for power external charging or solar on the roof. Any kWh in the battery of the nonplugin corolla is due to the gasoline burned in the first place, bar none. This is the severe limitation of the toyota hybrids. Not entirely true. Both the Volt and the Clarity PHEV have modes you can select which will actually use the gas motor to charge the battery pack. The energy efficiency is horrible, it’s wasteful and polluting, but you can do it if you want. We have seen quite a bit of advertising by press-release lately, to the degree that “over promise, under deliver” has become common across the industry. Yet, there’s no outcry about that. The fact that Toyota made an undeniable subtle comment bout the current state of our infrastructure is good reason to self-reflect. In other words, why is there still so much forgiveness in buying guzzling ICE vehicles while we wait for promises of years to come? Only you would try to spin an anti-EV commercial from Toyota as a good thing. Distractiong from the challenges of infrastructure and turning a blind-eye on subsidies by crying “anti-EV” is constructive how? Reality is, that’s an excuse drawing attention away from how the masses with embrace electrification. What is the plan from other automakers for their entire fleet? Taking the hybrid step to plug-ins is a solid means of quickly phasing out a wide variety of ICE choices, as well as overcoming change intimidation. There is a time and place for discussion of the current limitations of BEVs, and the need for improvements in the tech. But advertising for a car isn’t the time or place for that. It’s just EV bashing. So why are you defending that? From this and other comments, “Star Trek John”, I don’t think you’re a real supporter of the EV revolution. You of all people can’t call someone who has purchased a PHEV ‘not a real supporter’, when you’ve admitted you will NEVER buy an ev of any kind, ever. But to the rest of us it does seem like you guys are 2 junk yard dogs barking at each other – John being the more dignified one. Eric you’re overstating the case here….. Competitor Toyota is just briefly (3 seconds worth) saying that their 100% gas powered hybrid refuels much quicker than a BEV. That is not ‘hating evs’, that is merely advertising an advantage 100% gas powered cars have. John, we’re still waiting to see you post one bad thing about Toyota to prove you’re not on their payroll. Why am I not surprised you can’t do it? I guess Toyota thinks that paying someone to come to an EV site and try to spin their anti-EV stance will fool us? I will continue to ignore your posts that contribute nothing to the discussion. With the sorry fact that GM has discontinued at least 3 PHEVs means that the only serious competition Toyota will receive will be from Honda in the ‘Sedan’ world, and possibly “Workforce” in the plug-in truck world. What the current great brains at GM don’t realize (Toyota and Honda presumably still do) is that the several cars they discontinued travel their vast majority of miles totally electrically, recharge their batteries typically overnight in the most grid friendly manner, and no matter how many are sold require no new infrastructure – utilizing the excellent supply of gas stations for vacations. You don”t actually need his confirmation. The effect the guy gets is exactly the opposite, down-voted like hell, which is so much fun. It is like these lexus dealerships waiting for their former customers who jumped ship to Tesla to return. Erosion. It is like watching enthusiasts come to the realization that innovator’s perspective is very different from the mainstream mindset. Yeah, it’s called innovator’s dilemma. AKA head in the sand. And in Toyota’s case it’s head in the sand and fingers in the ears, while loudly screaming lalalalalala I can’t hear you. Sure a sensible step if you ignore the urgent need to be off fossil fuels ASAP, and your only concern is profit, screw what the planet needs. Car platform cycles last at least five years. We don’t have 10-15 years more to wait for the transition to start in ernest. GM didn’t fail because they listened to enthusiasts they failed because they only took half measures and never committed to the necessary volumes in a package that would succeed. Regular hybrids are a dead end and are not better than nonhybrids and this point when you consider how long they’ll be on the road. Plug-in hybrids are running out of room to be relevant as well. Tesla has proven what can be done if one commits fully. SULEV rated hybrids from Toyota are the fastest way to help the planet with significant reductions of both smog & carbon emissions across the fleet. To do that in high-volume, the technology must be profitable. Not understanding how much of an improvement those hybrids delivers is common, as is how simple they are to upgrade to plug-in. Too bad most people don’t take the time to figure that out. To make Prius hybrid a plug-in hybrid, all Toyota did was add a one-way clutch and a larger battery-pack with plug. That’s why it is so affordable and offers such great emissions & efficiency following depletion. As for comparing a well funded small start-up to a gigantic legacy automaker, that’s not constructive. We all know when the low-hanging fruit is gone (the early-adopter market), Tesla will face many challenges to reach mainstream consumers too. Having a smoker cut back to half a pack a day from a pack a day might reduce their risk of cancer enough, that’s not a bet I want to take with the planet. They reduce emission sure, but not enough, they are always burning fuel, that’s not sufficient. Essentially Toyota is tuning the piano on the Titanic, trying to tell everyone EVs are bad and everything is fine. Just listen to how good that piano music sounds compared to other pianos, right? Innovator’s dilemma. They can’t see the forest for the trees, or don’t want to, and push a disinformation campaign instead. John will keep throwing stones at GM/Telsa/etc, but true leaders are used to taking a few arrows in the back. Followers who don’t adapt just go extinct. A plug-in hybrid will dramatically reduce consumption & emissions. My Prime averages 80% EV driving, despite numerous long highway trips per year without a place to recharge. It’s a technology we can deploy immediately, due to its affordable design. GM failed miserably with Volt due to the cold, hard reality that it was too expensive to produce. That made it very unattractive to dealers and made the sticker-price unreachable for ordinary people. Your “not enough” isn’t constructive in 2019. You know quite well next-gen offerings will take battery-tech the next step to being realistic for the masses. In the meantime, the much needed infrastructure will be improved too. Most businesses don’t have any chargers at all. The few that do only have a couple. How does that help anyone beyond early-adopters? Weak sauce. More shoulda-could-woulda from John. Toyota can be patient all they want, scraping by with too little too late. Meanwhile the leaders will continue to move on ahead. I refuse to criticize Toyota or Honda in that they each make a very fine PHEV product. I just wish they’d offer more variety, but it is getting to the point where the Japanese are offering more compelling plug-ins than GM because GM discontinues even their sales leader. 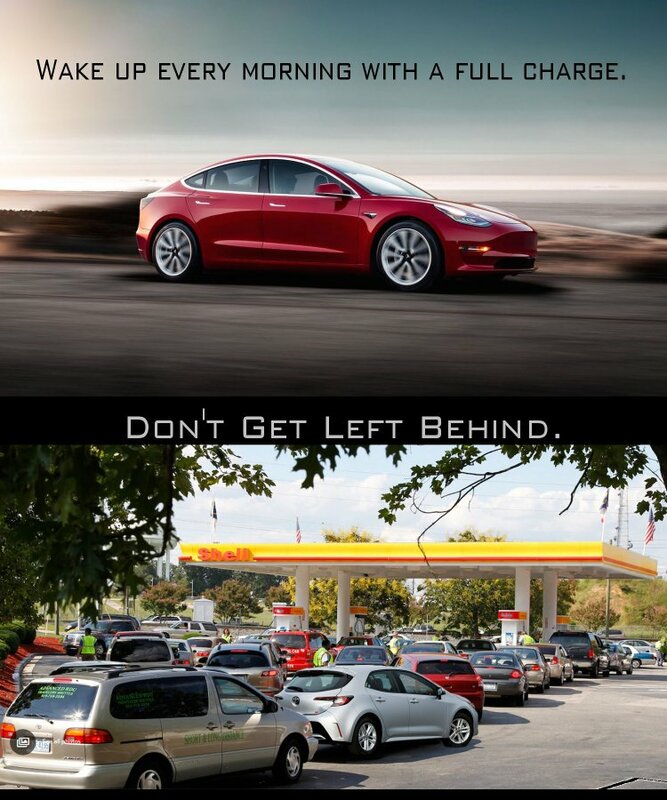 “Don’t get left behind”….Looks like Toyota might want to heed its own message as it paints a make believe universe of “self charging” hybrids. Toyota sales are definitely hurt by the plugins, which is very nice. Their fuel cell fantasy turned to be a comedy, which is also very very nice. It will be very beneficial to have one stubborn incumbent decimated and toyota is a nice pick for this. Good point. The EV revolution does need a cautionary tale; a poster child for foot-dragging by legacy auto makers, swimming against the incoming tide of the EV revolution*… and Toyota has made itself into that, in spades! Hydrogen is a waste. It is stored either as a compressed gas (low density) or as a cryogenic liquid (requires energy to keep cold. Either is extremely dangerous if there is ever a leak (kaboom). Pure EV is the future, but it is NOT today. Battery density, cost, life cycle, and environmental impact are all issues. Until we have denser, cheaper, longer-lasting, and environmentally friendly batteries on the market, some sort of hybrid will have to be part of the transition, especially when considering larger vehicles that need longer range. In my opinion, the best approach to these issues is the range-extended EVs (like the workhorse truck). With a medium sized battery (40-60kWH), and an efficient ICE onboard, you can run on battery for daily commutes and have the range available when longer trips are necessary. For trucks, you get an efficient daily driver, while still being able to go “off the beaten path”, or tow a trailer cross country. Plugin hybrids will be a necessary link for the next decade. On the bright side, if done right, they could be designed to allow better batteries to be retrofitted, when available, to allow all-electric drive in the future. Win-win, right? Now, if we can only get a company to make such a PHEV. They don’t sell Workhorses’s by me yet. 0:46. What type of EV is that? Doesn’t look like anything I know of? Most likely not even an EV at all as making a vehicle you’re putting down as non-descriptive as possible is what the legal team demands. It literally could be an old school cardboard mockup or a modern computer generated image. They’re confusing gas car with EV. No one stands next to charge port while charging, but almost everyone stands next to gas filler at gas station. That’s a rather brilliant commercial for such a ho-hum car. Next Big Thing from idiota. Self-charging home burning gasoline to create electricity… it is so self-charging that no one in their right mind does it. The only energy source in their hybrids is gasoline and no matter how much electricity they do on board of the car it all comes from the gasoline 100%. Not so dumb….. People here complain that a PHEV is always dumb and a BEV is always smart because why have 2 drive trains – even if the PHEV model is much cheaper than the BEV. Of course, in ‘upper crust’ neighborhoods where most of the ev’s are, almost all homes around here have backup generators exercising themselves every week for a power failure that never happens. That is a ‘wasted ICE’. Toyota won’t die, it’s way too big and too important for the Japanese economy, the government would never allow it to go under. Yeah, TEPCO is still alive, Toshiba is still alive, so there is that…. ah more government debt you’re saying and printing money. Think again. What a brilliant commercial!! I love it! But… I don’t want to go back to Gas car. I love the commercial though. Commercial itself was very well done. I also like the Supra commercials that have been airing in the US. The funny thing is that most of the cars it’s passing from like the 1930’s on would actually destroy the Toyota in a race, as they are much faster. I suppose they are trying indicate their cars are an advancement over earlier modes of transportation. Hybrids are slow, and filling up a hydrogen/hybrid is not just not happening, or going to happen, anytime soon. So that whole effort is just a non-starter, except perhaps in Japan where it’s supported, and promoted, mandated, by the government, otherwise it’s not viable. With a gas hybrid, you are still burning gas, though less of it. It’s a technology that’s been superseded. It’s over, or soon will be, for hybrids. Why have two motors, of different types, more complexity, more costs, more things to go wrong, less efficient, when you can have one propulsion type that’s highly efficient, reliable, and long lasting. So it pollutes less than the gas guzzlers, but only beats the ev because you have to charge the battery. That’s rich.. Still it’s hard for me, as Toyota does produce a good product, but just not a bev. and that’s a big problem for Toyota, whether they recognize it or not. The cars from the 30s were NOT faster than the Corolla. Yep, a 1930’s Rolls Royce Phantom had about 50 hp engine and if you push it, it went 70-80 mph. That was considered a supercar. ICE power train meets EV power train and it’s NO compromise???? My choice for oxymoron of the week. Then Toyota will either be left behind or just play more catchup with the rest of the industry. The only thing I got from your wall-of-text post was that Toyota obviously pays your salary. Obviously wrong. You go to great lengths to paint a picture if doom. What is the motive for that? I see a path to electrification based on extensive background & research. So, it’s really easily to look past the rhetoric. Corolla Hybrid. RAV4 Hybrid. Corolla PHV. C-HR EV. It’s a plan to get customers of all sorts to abandon traditional vehicles quickly and without dealer pushback. You are absolutely correct John. With the addition of the Corolla Hybrid, Toyota will offer 9 electrified vehicles, and 6 more under the Lexus Brand. Almost all can be fitted with a larger battery and a plug, and some eventually will. No company comes close to offering that variety of electrified models. Other than the PIP, the batteries in these vehicles never have to be plugged in to charge. By definition, that means self charging!! It’s actually a pretty good commercial, if you were to take out the EV bashing and the “self charging” nonsense. In fact, some EV manufacturers could learn a thing or two from this commercial. First, a charging EV will not catch up to the Corolla when it comes time for the Corolla to fuel up and speed off again. Second, Corolla is one of the industry leaders in hybrid engines, just as Tesla is a leader in EV. It’s an apples and oranges comparison, but then again, people like to race Tesla Model 3’s against BMW’s and Porsches and then say how much faster an EV is. 329,196 sold last year in just the United States… a land of SUV crazed consumers. Not a single one of them had the influence/dependency of a tax-credit and the result was a tidy profit for automaker & dealers. Whether or not that’s called “leadership”, it is an example of solid business… which is exactly what’s needed to position the entire fleet for motor & battery use. And Toyota marketing department is getting a bonus … everyone following EV’s is talking about their ad. They must be having ball … goal reached. This should be the Tesla response ad. What a brilliant ploy by Toyota’s marketing: Highlighting how a hybrid EV can be even less efficient, even more energy-wasting, even more polluting (per mile) than a gasmobile… by using the gas motor to charge the battery pack! I really hope that Toyota will “see the light” and join the EV revolution. But when I see what amounts to anti-BEV propaganda from Toyota, things like this, then the dark side of my soul wants to see them fail. 🙁 Well, if they keep going down the road they’re on, that will certainly happen. No one told toyota that the regular ICE cars have been self-charging in this this respect for more than a century, relying on a tank of gas. They believe they discovered something. A lot of toyota/lexus defectors discovered Tesla. I think what really hurts non-Tesla EV’s is not this Toyota commercial (how many people have enough time to watch commercials, anyway?) but the unresolved deficiencies of the current battery tech, compounded by the undeveloped and still haphazard DCFC “nutwork”. Toyota is smart in having a diversified product line up that meets the needs of a wide range of consumers. The 2019 Corolla is one model that is designed to meet the needs of one market segment. The ad is no more “an attack on electric cars” as it is on the horse and buggy! Anyone know if the Corolla hatchback hybrid will be coming to the USA? Toyota hybrids are being abandoned in droves for a far better car in the model3. Which would explain why they are heavily promoting the car with ads like this. Toyota makes really boring cars that are becoming increasingly strange looking. In fact, the whole company is becoming strange. And yet Toyota are reportedly working with Panasonic to develop solid state batteries for EVs. They’ll no doubt continue to be playfully EV-hostile, fork-tongued, and self-servingly schizoid until it suits them to cash in on the now unstoppable EV revolution. I’m both surprised and not surprised. Not surprised by the anti-EV motive from Toyota no less in this UK-specific ad, but I was surprised that EVs were given a dig at since I’ve first saw this advert as an Irish-market clip and the dig at the end was re-edited showing the Turbo Diesels billowing smoke which was much more appropriate and funny even. No one is looking at you with envy for driving a Corolla. Trust. Wanting It done quickly rather than done right has consequences. Look at GM’s rush to market with Volt. It’s production will soon end with no successor. That proved a massive waste of tax-credits. Toyota’s plug-in approach is slower, but stands much greater chance of reaching mainstream consumers affordably and in large quantity. I agree 100%. Toyota – along with other entities – is working on new battery technologies until it can actually complete with ICE in all categories. Well done Toyota. The world is only ready for a max 2% of drivers to go electric without national grids failing. The infrastructure just isn’t there. And nobody wants a diesel. So hybrids are the right solution for today. Maybe that won’t be the case in the distant future, but who cares – Toyota is spot on in its strategy. It is a MYTH that electrical infrastructure is old. There is plenty of ability for the infrastructure as it is to handle any EV loads placed on it. A far more pressing question is, what portion of the general public will PAY for fast-charging facilities, and to what extent will they use the expensive facilities? Its self charging no doubt but its charged with petroleum! BYD sold 28,668 plugins in 2019-01 and soon they will rout Toyota in China and then step in to Japan. This commercial is lame. Toyota is still focused on fool cells, I mean fuel cells. That requires turning a blind-eye to Corolla PHV and C-HR EV. Both those upcoming plug-ins contradict the narrative of Toyota not showing any interest in advancing their electrification choices.